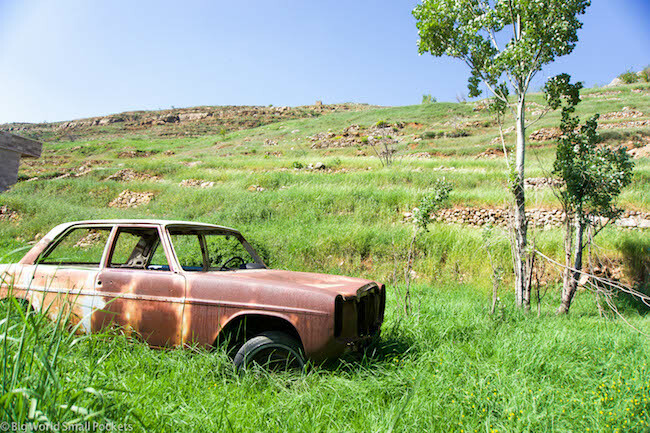 One of the beautiful things about travelling in Lebanon is, of course, the country’s outstanding beauty! Another beautiful thing about travelling in Lebanon, is the country’s wonderfully compact size. 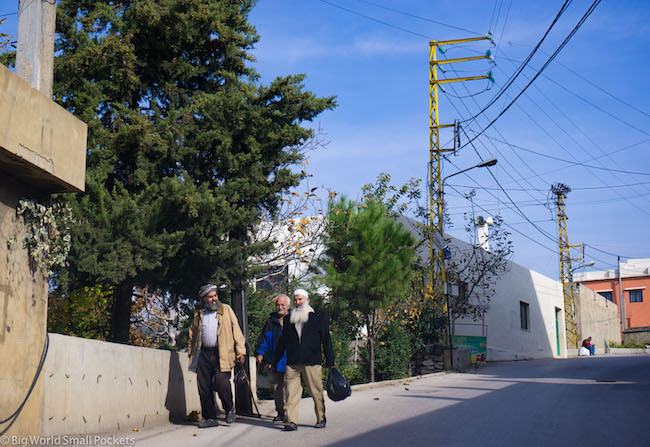 For Lebanon is small – tiny in fact – which makes seeing a lot of it, or at least the touristic highlights, more than possible within a short timeframe. Because most travellers don’t realise just how beautiful Lebanon is, they sadly come to this country with a very limited amount of time to explore it. And so, with that in mind, here is my complete Lebanon itinerary – a one-stop guide to seeing the best of this country in just 7 days. I’ve actually given you 2 options in this article – the first works best if you want to base yourself in Beirut and simply day trip from there, while the second provides a complete circuit road trip if you plan to hire a vehicle in Lebanon. 48 Hours in Lebanon – Cramming in the Best Bits! Allow at least one full day to explore Lebanon’s wonderful capital city. Hugely diverse and throbbing with a youthful vibrancy and energy, it makes a great introduction to this enchanting country. While simply wandering the streets of the city is a good way to take everything in, there are several highlight attractions I’d recommend visiting too – these include the National Museum, Sursock Museum and Beit Beirut. Wandering the glitzy Corniche area is also a must, as well as heading to The Pigeon Rocks to enjoy the incredible sunset views. If you’d like to stay in this area of Beirut, the Hamra Urban Gardens offer good dorm beds and a welcoming, clean space. 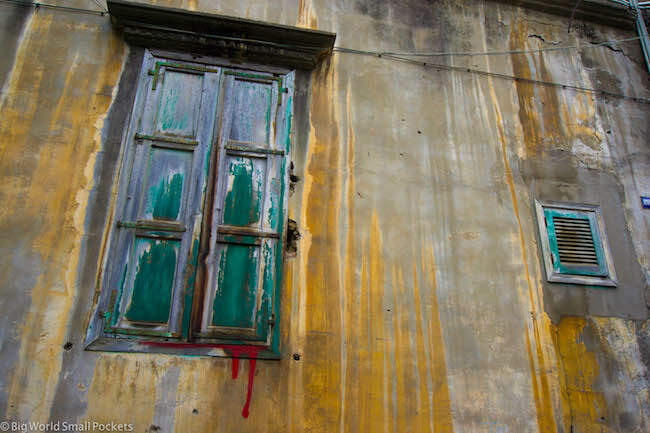 Otherwise, the Gemmayzeh area of Beirut provides hipster cafes and galleries a go-go and nearby Mar Mikael is full of fun bars to hop between almost any night of the week. And when it comes to staying in the heart of the action, look no further than popular choice – Hostel Beirut. With a top location, a guest kitchen and some of the best-priced dorm beds in the city, this is a good spot to meet other travellers while you chill on the roof terrace. On Day 2 of your 1 week Lebanon itinerary, it’s time to head north of out Beirut to explore one of the country’s greatest natural wonders – Jeita Grotto. An amazing underground network of seriously impressive caves, it’s easy to spend a few hours here – with a short documentary film, short cable ride and boat ride all included in the fun. Probably the easiest way to get to Jeita Grotto from Beirut is using Uber and you can then use this app again to get you from the caves to the cable car that will whisk you up to Harissa. Once there grab your camera and prepare to be amazed by the view! Jeita Grotto and Harissa make for a short day trip, so set off early in the morning and you can be back in Beirut during the afternoon to explore the parts of the city you missed on day 1. 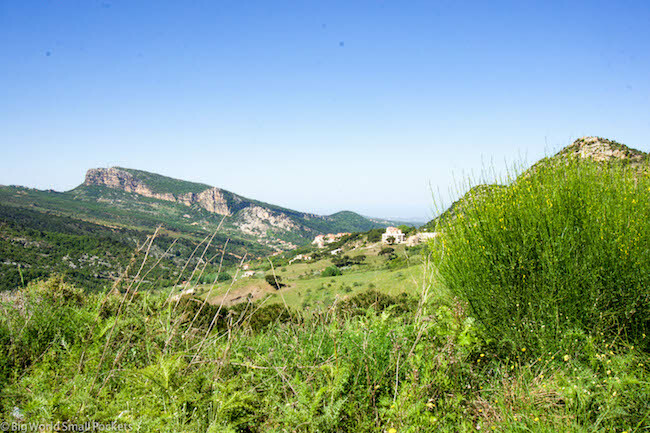 Heading up to the north of Lebanon on day 3 of your itinerary is an absolute treat and will provide you with some of the most scenic views in the whole of this scenic country! A spiritual place for the Maronite Christians, the Qadisha Valley is chock full of ancient monasteries to discover and hikes to enjoy. Heading on from here to the famous Cedar Reserve will give you yet more opportunities for hiking and a chance to enjoy the fresh alpine air as you ascend the mountain. Depending on the time of year you visit, you may even have the option to ski in the Cedar Reserve or, at the very least, enjoy the views of the surrounding snow-capped mountains. Either way, ensure you come appropriately dressed! I visited both the Cedars, the Qadisha Valley, Bcharre and the Monastery of Kozahya as part of an amazing day trip with Explore Lebanon, who I highly recommend for their professionalism, flexibility and great customer service. Led by the wonderful Nicola, check out their website here. 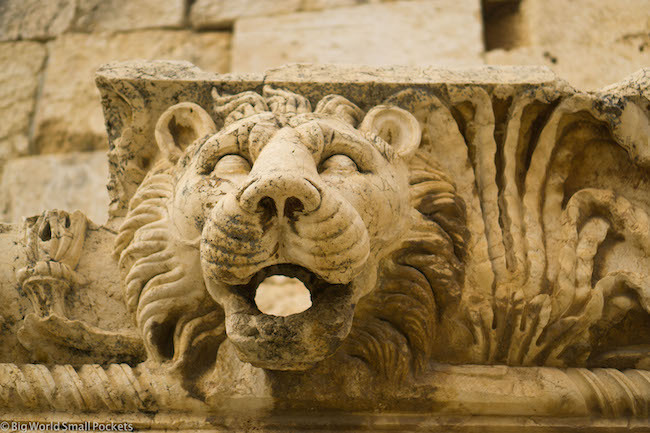 On day 4 of your Lebanon itinerary, it’s time to head in the other direction and make your journey to the most southerly city in the country, the coastal delight of Tyre, also known as Sour. This is probably my favourite city outside of Beirut, mostly because it boasts one of the most amazing beaches in the whole country. 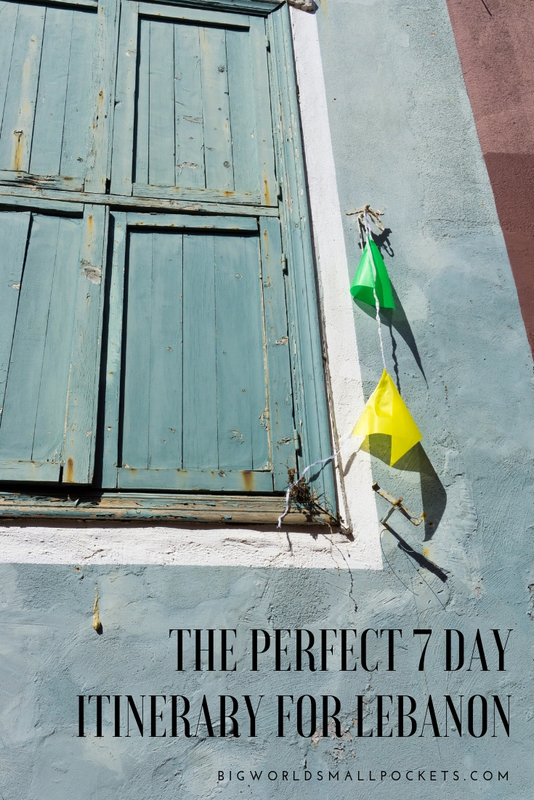 Before hitting the sand however, do check out the UNESCO-listed Old Town, bustling souks and busy fishing harbour of this city, before stopping to marvel at the seaside Roman ruins that are still clearly visible. After that, head to the beach to enjoy a relaxing afternoon, before grabbing a bite and a sunset beer right on the sand at local café Cloud 59. Day 5 of my Lebanon itinerary sees you heading back north from Beirut to take in the ancient city of Tripoli, which feels very different to both Beirut and Tyre / Sour. 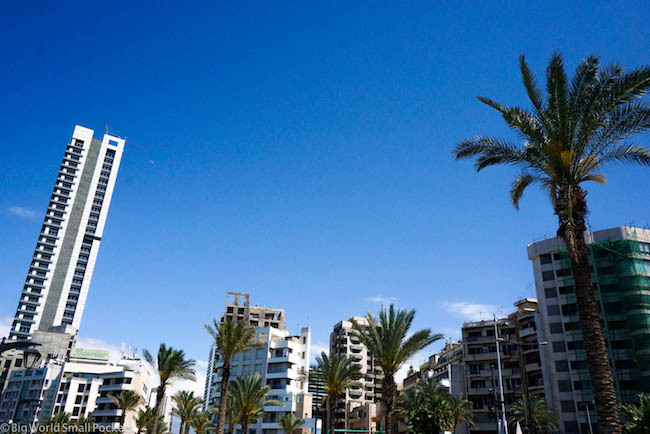 It’s easy and cheap to get either the Connextion or Tripoli Express buses from Beirut all the way to this northern city and once there, taking in the very different cultural vibe is an awesome way to pass a few hours. Must sees includes a visit to the Souks, the old World Expo area and the Citadel. Do make sure you take your camera to Tripoli too. In many ways, a day trip here feels like stepping back in time. As you start to wind down on Day 6 of your Lebanon itinerary, it’s the perfect opportunity to head to the coastal towns of Byblos, Batroun and the nearby monastery of Our Lady of Noorieh. Head to first Our Lady of Noorieh Monastery and enjoy the gorgeous views and peaceful ambience. There’s a shop here which sells some wonderful products made by the nuns and is a great spot to pick up some delicious Lebanese food items such as Pomegranate Molasses, Olive Oil and Zatar to take home with you. After this, swing by the quaint town of Batroun to take in the Phoenician Wall, souks and coastal views. Enjoying a homemade lemonade here at Hilmi’s is basically a rite of passage! Supposedly one of the oldest continually inhabited cities in the world, Byblos is your final stop today and a must see on any Lebanese itinerary. Again wandering the souks, cobbled streets, tiny harbour and taking in the views is the best way to soak it all in, before enjoying a sunset drink amidst the amazing setting of Kina Handcrafted Bar! I would never think of travelling to Lebanon without proper coverage and always recommend travel insurance from World Nomads who I’ve used during my time in this country and throughout the Middle East. I love their great coverage of outdoor activities – crucial for travel in a country like Lebanon – as well as their excellent customer service and ability to claim online, which is very handy if you’re travelling in remote places for a long time. And finally, on the last day of your Lebanon itinerary, it’s time for the piece d’resistance, the amazingly UNESCO-listed Roman ruins of Baalbeck over in the east of the country. Close to the Syrian border, it’s best to check the security situation before heading here, or take a tour if you feel less confident. Once you’ve wandered these sensational ruins, which are undoubtedly some of the most impressive in the whole of Middle East, it’s time to head to the nearby Beqaa Valley – Lebanon’s premier wine growing region to enjoy some tastings and a spot of lunch amidst the gorgeous natural surrounds. Joe from Beirut Pub Crawl runs some great tours to Baalbeck and the Beqaa Valley. Check out his website for more info. Got Some Extra Day in Lebanon? 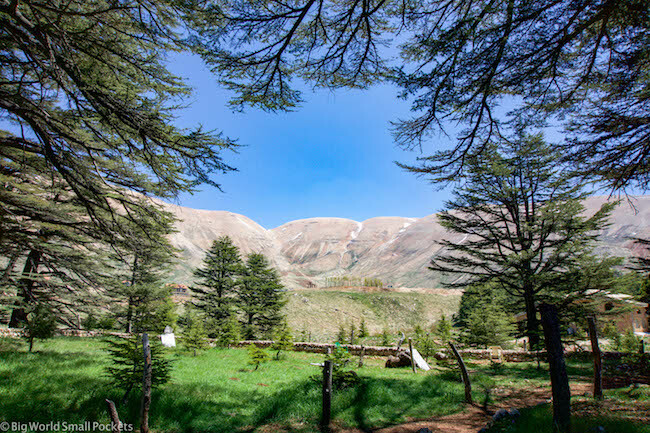 Why not check out the Beiteddine Palace, the Shoaf Reserve, the Aakkar region or some off the beaten track hiking adventures with Trekking Lebanon! So there you have it, my perfect 7 day Lebanon itinerary for those who want to base themselves in Beirut. #1 Lebanon Bradt Guide – An excellent resource when it comes to finding out the history of what you’re seeing in this country without the need for a guide, the Lebanon Bradt Guide is a must. #2 Head Lamp – Great for taking into Roman Ruins, Jeita Grotto or just dealing with the powercuts you may experience. I love my Black Diamond Storm, which served me super well in Lebanon. #3 Sun Hat – Trips to the beach, the mountains, the monasteries and the ruins will mean many hours in the hot sun of Lebanon. Do yourself a favour and bring a wide-brimmed hat to protect you. I love this Hello Sunshine design. #4 Long Thin Trousers -While Lebanon isn’t a super conservative country overall, you’re unlikely to feel comfortable in some areas walking around in anything too short. As such a pair of long, thin cotton or linen trousers provides the perfect attire for this hot country. #5 Walking Shoes – Coming to Lebanon and not getting out for a good hike is like going to Switzerland and not eating chocolate. As such, I highly suggest bringing a pair of good walking / running shoes so you can enjoy this beautiful country at its best. Base yourself in the capital city and get your bearings. Explore the city’ galleries, cafes, bars, museums and architecture. 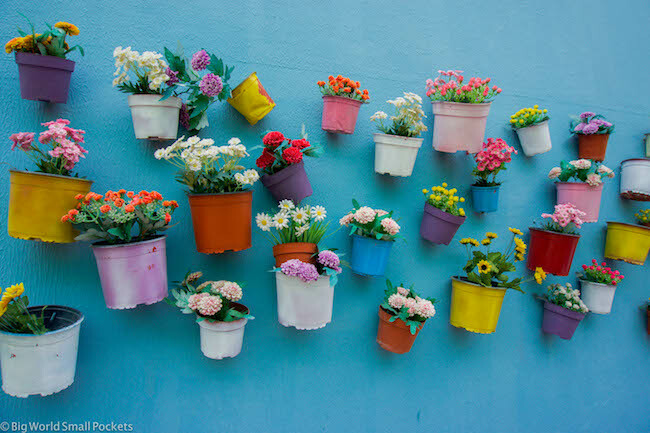 Stay at Hostel Beirut or Hamra Urban Gardens. 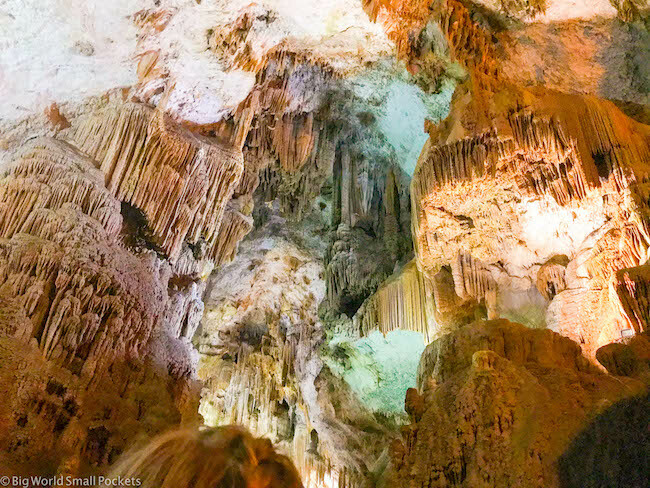 Pick up your hire car and head out to the amazing cave formation of Jeita Grotto. 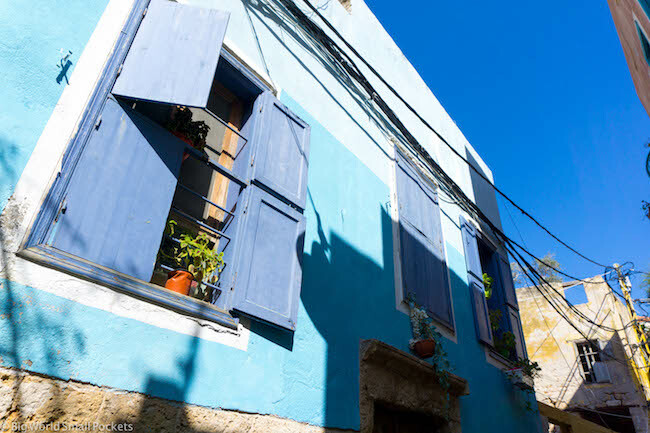 Afterwards, head onto enjoy an afternoon in one of the oldest inhabited cities in the world – Byblos – before heading to neighbouring Batroun for the sunset and a drink at Rays right on the shore. Stay at Mayyouli Guesthouse in Batroun. 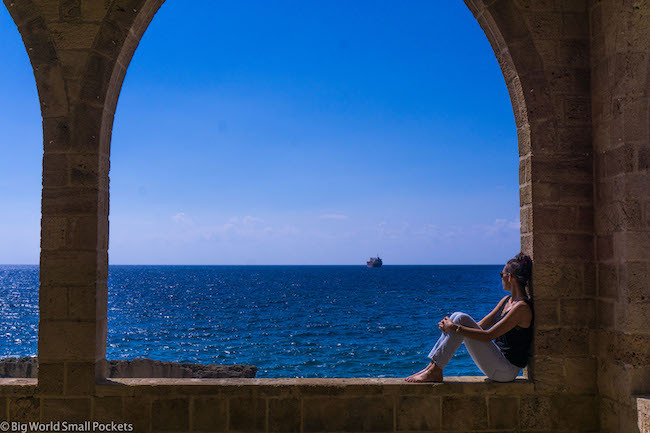 From Batroun continue north to Lebanon’s second city – the ancient town of Tripoli. Don’t miss the soaks or the citadel here, before you continue on to the country’s premier ski resort – The Cedars. Even out of season, you can enjoy some lovely hiking and top views from this gorgeous reserve. Stay at the Tiger Guesthouse in Bcharre. From the Cedars make your way to the east of the country to explore the amazing UNESCO-ruins of Baalbeck – some of the most famous ruins in the whole of the Middle East. After that, it’s time to kick back and soak in the views of the gorgeous Beqaa Valley at one of the area’s wonderful wineries. After your night in the Beqaa Valley, it’s time to take a drive to the amazing Shoaf – an area of natural beauty and protection. Enjoy a short stroll or opt for a longer hike here before heading to the amazing Beiteddine Palace. Stay at Deir Al Oumara Guesthouse in Dier El Kamar. 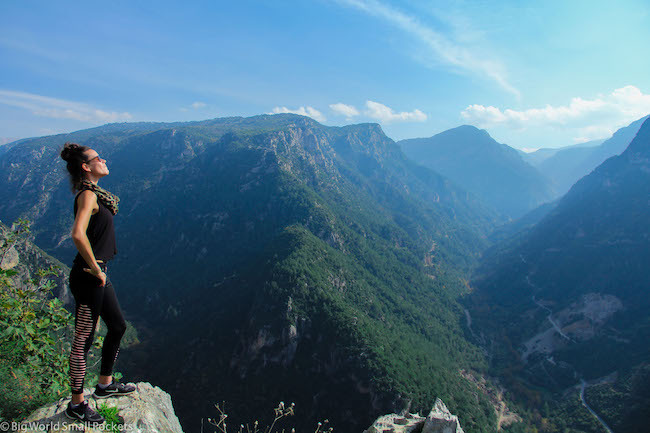 LEARN MORE: Solo Female Travel in Lebanon : Is It Safe? On the penultimate day of your Lebanon itinerary head to the country’s south to enjoy the cities of Sidon and more importantly, Tyre. Also known as Sour, Tyre has some bustling souks, a beautiful fisherman’s harbor and a delightful UNESO-listed Old Town to wander. 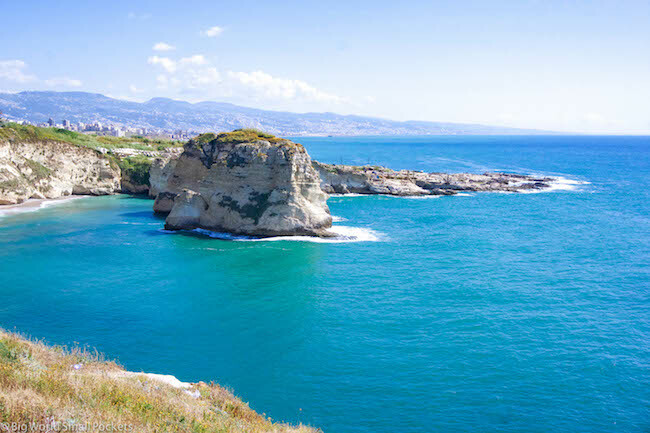 After you’ve checked these out and seen the coastal Roman ruins, it’s time to head to hit the beach and enjoy the sun, sea and sand at one of Lebanon’s finest coastal areas. Stay the night in Tyre at one of the many good AirBnb options. Get £30 off your AirBnB booking by clicking HERE! And finally, on Day 7 of this Lebanon itinerary, it’s time to return to Beirut and sadly get ready to depart this gorgeous country. 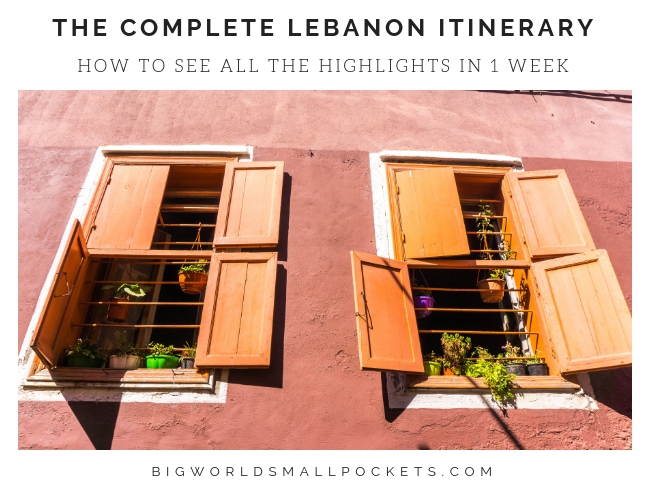 And if you’re on a shorter time frame – don’t miss my guide to spending 48hrs in Lebanon and still seeing the best bits! So that’s it folks, my complete Lebanon itinerary and your one-stop guide to seeing the best of this county in just 7 days! Hi Steph, Is it possible to visit the Palestinian people in Gaza before or after Lebanon.? Thank you for this wonderfully evocative article.So what to go there. Hi John – what to say to this question?! Gaza is an area of great political instability and I would certainly do your research and consult your national foreign office before even thinking about going there. In terms of linking with Lebanon, Gaza is neither in Lebanon, nor does it border it, so I’m confused as to why you link the 2? 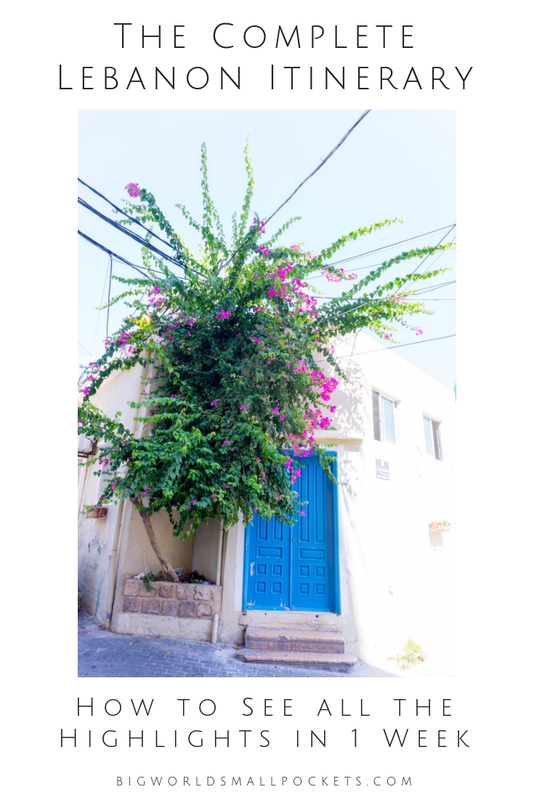 You’ll need to learn about Isreali border controls and what having a Lebanese and / or Isreali stamp in the passport will mean for your future travels. This is a very complex question in a sensitive region. Hi! I am wondering if you might have thoughts on which of your two travel options would be most budget friendly? I am mainly wondering about the costs of transportation – care hire for a week versus day trip car hire. I’m doing about a week in Lebanon with a friend and would like it to be a leisurely trip so in some ways the idea of going back to Beirut each night sounds like a more relaxing ‘home base.’ But budget is also a deciding factor. Thank you!